Staggs Bar - National Pub of the Year Finalist! CAMRA Scotland & NI Regional Director, Sarah Crawford, presents Nigel Finlay with the National PotY Finalist certificate. 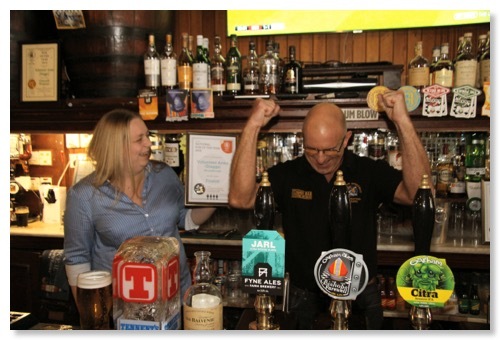 After being voted Lothians Pub of the Year and Overall Branch Pub of the Year, Staggs Bar, Musselburgh went on to win the Scotland & Northern Ireland Pub of the Year award in August. They have now been named as a Finalist in the CAMRA National Pub of the Year 2018 competition - or in the words of the CAMRA press release, “one of the best four pubs in the country”! The winner of the National Pub of the Year title for 2018 will be announced in February 2019. Well done to Nigel and Katie, and best of luck!